Binge-watchers and TV lovers is in for a treat with SKY's new Half-Off Deal promo. 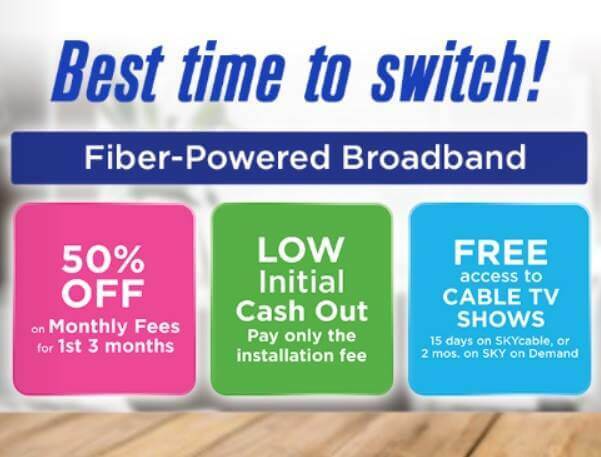 They are offering 50% off on their fiber broadband bundle plans and cable TVs, the One SKY. Customers that are in areas covered by One SKY's service can enjoy 50% off their basic monthly service fee for the first three months of their plan. They are also entitled for a low initial cash-out since they are exempted from the normal advanced payment scheme. According to SKY, their bundles are a sort of a budget hack since it can help save a few bucks compared to opting for individual plans. It also provides a lot of options in terms of what they want included. One SKY Premium - This includes unlimited internet and HD cable TV. One SKY Lite - This includes internet connection with a limited usage allowance and HD Cable TV. One SKY Broadband + VOD - Fiber Powered Broadband internet with free access on Video-On-Demand service. Those who choose either the Premium or Lite package will have a bonus of free 15 days access to all SKYcable channels while those who opt in for the Broadband + VOD will have free access to the channel pack included in SKY On Demand for two months. This promo is until April 30, 2018 only. Drop by any SKYzone business center or visit mysky.com.ph/switch for more details.